The controversial Anti-Counterfeiting Trade Agreement (ACTA) has lost more support in Europe after Bulgaria and the Netherlands refused to sign the treaty citing concerns regarding privacy and human rights. They join Germany and Poland, both of which refused on similar grounds. Bulgarian economy minister Traicho Traikov said his country will refuse to sign ACTA in its current form because they feel it will curb freedom to download movies and music for free and further encourage internet surveillance. "I will table a proposal to the Council of Ministers to stop the procedure of Bulgaria's signing the Anti-Counterfeiting Trade Agreement,” he said in a statement to the Guardian. "Bulgarian society is not ready to accept mechanisms which raise suspicions of violation of the freedom of expression and freedom [on the] internet," Traikov further commented. The downloading of movies and music is commonplace in the country, and many of its citizens fear that the signing of this treaty could lead to many poor people facing prison sentences for illegal downloading. Last Saturday, citizens protesting the treaty marched over 4,000 strong into the capital city Sofia in protest, calling on the government not to sign it. Similar demonstrations were also held elsewhere in Europe, most notably in France, Germany and Ireland. The Netherlands also joined the ranks of those refusing to ratify the anti-counterfeiting treaty, with the Dutch Lower House backing a motion by the Green Left party arguing that the country should avoid signing the agreement in its current form until thorough investigations have been made, and it has been established that it does not threaten the rights and privacy of the country’s internet users. Despite Germany, the EU’s single largest national economy refusing to ratify ACTA, it already has the majority of the member countries signatures. In all, 22 EU countries have signed the anti-counterfeiting treaty, joining the US who signed it in October last year, as well as Australia, Canada, Japan and South Korea. 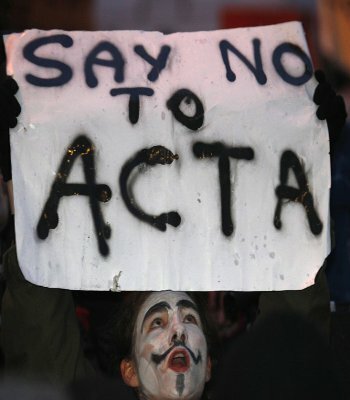 ACTA may have the majority of the EU’s approval but it has to pass through the EU parliament in June before it can be enforced. The secretive agreement faces mounting pressure and strong opposition from EU residents.